WHY: The anti-mafioso all-black-suit look. 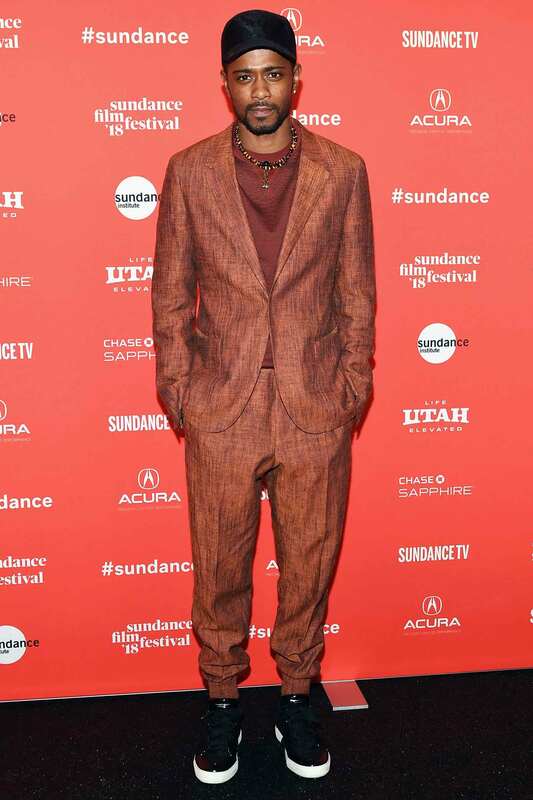 WHY: Stanfield is one of few guys who can make wearing an orange suit in front of an orange step-and-repeat look natural, easy, and chill. WHY: Introducing the red-carpet ballcap. That’s now a thing. WHY: If Timothée Chalamet doesn’t make you a believer in short-length pants, we don’t know who can. WHY: A millennial pink suit with a citrus green turtleneck and dad sneakers sounds like a lot of trends for one outfit, but Khalid nailed it. Guy is a charmer. WHY: Tyler The Creator dressing up without trading in an ounce of his colorful, California style is proof that wearing a suit doesn’t make you one. WHY: A badass actor needs a badass suit, and it doesn’t get any more badass than double-breasted pinstripe tailoring and purple socks. WHY: We’ve been on board with side-stripe pants for a minute now, but Rockwell’s making a strong case for what we’ll call…crotch-stripe pants?…with this wild Prada look. WHY: Theroux wearing all black and a leather jacket isn’t news, but this slicker, lux-ier version from Louis Vuitton makes the uniform look fresh. WHY: Pharrell demonstrates the beauty of getting dressed in 65-degree weather: wearing a jacket turns your T-shirt into an outfit. WHY: Ramirez does classic Italian-guy charm in this broken-in corduroy suit worn with a ribbed sweater and lace-up boots. WHY: If you’re wondering how to wear track pants to the office, John Cho’s polished look is a solid template. WHY: Taking a Sharpie to a pair of $690 chinos seems crazy, but Bieber’s got the right idea with this mashup of SoCal skater style and East Coast prep. WHY: Consider Legend’s excellent off-the-runway Van Noten fit permission to dress like it’s summer no matter where you’re going. WHERE: At the premiere of Westworld season 2 in Los Angeles. WHY: Simpson goes monochromatic and mixes textures in this tailored rig that would impress at the office as much as it would at your next wedding. WHY: Idris Elba is a man with the confidence to pull off just about any look damn well—including an all-white fit anchored by mega-hyped Air Max kicks. WHY: Jonah Hill Fit Watch 2018 kept getting better and better and the actor’s impressive May outfit—a navy double-breasted suit anchored by a floral shirt and white leather loafers—only proved he wouldn’t slow down anytime soon. WHY: When you’re hot, you’re hot: Glover rocked this red-hot fit at the Solo premiere…a week after showing up to the Met Gala in head-turning lavender. WHY: Proof that a three-piece kit doesn’t have to be a suit, so long as you layer interesting pieces like the Deadpool star does here. WHY: In 2018, Goldblum was never not working his elegant man-of-the-world-meets-jazz-frontman vibes. This outfit only proved that status quo was very alive and very well (and still looking very good). WHY: Hawke aced the done-up-but-undone mix (see: this sharp navy suit, that broken-n brown belt) that feels a hell of a lot more right than wearing a tie does these days. WHY: The NBA’s loudest dresser was always going to turn things up a notch—but notice how he nailed everything else (fit, accessories, bowtie) before getting wild with it. WHY: The best way to keep a classically tailored suit/shirt/tie rig from looking fusty these days is to wear it wear it with sneakers—and, uh, the finest dad hat of your choosing. WHY: If this is what the future of Dior holds under new designer Kim Jones, we’re all in. WHY: Come for Boyd’s glorious mane of hair, stay for the frontman’s elevated mix of neutral hues (and those excellent summer-ready slip-ons). WHY: You give The Rock a press tour and he will give you ultimate leading man style, in this case with a next-level suit worn with a complimentary patterned shirt. WHY: Jackson’s whole look is a reminder that wearing a suit right now means wearing it however the hell you want to. WHY: Only an advanced dresser like Miguel could convince us that bold stripes, peach pants (with more stripes), and chunky creepers was a mix worth trying out this summer. WHY: Sanders is a man who commits to a look, and he did right by this swanky DB fit from the Brit designer. Bonus points for the deluxe chain-detail loafers. WHY: Miller wore what the iconic brand calls a “duxedo,” which is a three-piece rig made from the label’s hard-wearing duck canvas. It was weird in all the right ways, like all the best menswear was in 2018. WHY: Navy, lavender, and plum—paired with Birkenstocks no less—is a 202-level color combo that a stylish O.G. like McCartney knows how to get away with. WHY: A check blazer looks 100% less geezer when A.) it fits you better than a leather jacket, and B.) you wear it with a T-shirt and sneakers. WHY: If you want to look crazy-rich, you do it in a Tom Ford a shawl collar tuxedo, slicked-back hair, and a big, mischievous smile. WHY: A-Rod proved that a tan, lightweight suit in the heat of summer can still fit like a dream. WHY: Shawn Mendes turned up the confidence on his basic rocker style, and somewhere, Harry Styles burned with jealousy. WHY: It takes swagger to wear this shade of yellow—let alone three times in one outing. WHY: Please allow Bradley Cooper to remind you why you need a brown suit. And maybe even a pistachio dress shirt while you’re at it. WHY: Mahershala Ali, twice in one week, proved that attention to fit and a little bit of color goes a very long way. WHY: It takes skills to wear a bonkers suit, nail the fit, nail the pose, and also wear yellow cowboy boots. RuPaul possesses such talents. WHY: Tech-y Streetwear Pro meets Vacation Uncle meets Hypebeast is Mayer Style in its finest form. WHY: Part late-night-guest swagger, part 2018 rapper, this fit checks every box. WHY: This year, it appeared that Chalamet was on a mission to wear every swerve-y suit out there for his movie’s press tour. We fully supported the cause. WHY: Plaid suit, leopard print boots. Ross Lynch might be an actor, but his style is all rock god. WHY: The camel topcoat is always cool—especially so when it’s luxed up by The Row. WHY: Banker stripes made badass. WHY: This year, Miller emerged as the patron saint of “You Do You.” Naturally, he killed it in this patchwork jacket from the up-and-coming N.Y.C.-based label. WHY: Proof that a four-piece fit can be galaxies away from anything basic. WHY: Reilly is an unapologetic menswear head of the highest order and we’re very much here for it. WHY: While everyone else was in labels, LeBron was over here killing it in simple, sophisticated neutrals. WHY: When we talk about the Golden Age of Pants, this is exactly what we mean. WHY: We’d be smiling ear to ear if we were wearing this double-breasted stroke of genius, too. WHY: Snakeskin shorts in December. Now that takes swagger.